Sims Patrick Studio, Inc., an Atlanta-based interior design firm, has been selected to work alongside Moser Mayer in the redesign of the Mews. The company, Sims Patrick Studio, Inc., was founded by Libby Sims Patrick, in May 1998 and incorporated later that year. 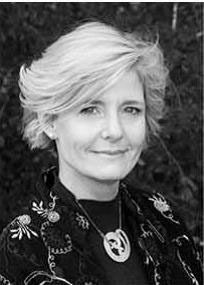 Libby received her Bachelor of Interior Design at Auburn University in 1982, and her professional certification (NCIDQ) in October 1985. Her design background of over twenty five years spans the interior design and management of a variety of large project types ranging from hotels, shopping centers, multi-family housing, mixed-use, entertainment facilities and healthcare. We recently chatted with Libby about the Mews Renovation project, her vision for the redesign, and what some of her favorite parts of this project have been! We hope you enjoy…. Yes, the history of the Graylyn property and Mrs. Gray's vision for the estate was in the forefront of the development of our design direction for the Mews. The types and quality of materials that were used in the mansion were also applied to the palate of materials used at the Mews. For instance, we have used hardwood floors, wood paneling, wrought iron, tile and stone in the Mews. The best way to describe our thinking and inspiration might be that if the Main House is the living room of the property, the Mews is the Den! We did not have an unlimited budget like Mrs. Gray might have had at the turn of the century, but we certainly tried to be true to the casual character of the Poultry House and Stables within the French Normandy style architecture. 2. How does the Mews project differ from other re-designs you have done? The Mews guest rooms and Conference center are really more of the development of a new "brand" of hotel style. Each guestroom layout is completely different from the next which is not like a typical hotel renovation. We were able to use the experience that we have gained from our work with the prototypes of the major brands for function and amenities. However, the major, welcomed difference from our typical renovations was that we were able to add a layer of "lifestyle" design to the project which makes it more of a "one of a kind" boutique hotel experience. 3. What factors did you take in to account when selecting fabrics, fixtures, etc? Durability and wear factors for upholstery and casegoods were extremely important. A casual, elegant residential feeling guided the selection of the color palate. We selected a combination of rough with smooth and old with new textures and added a modern twist with some shiny things, modern artwork and accessories. 4. Do you have a favorite room or piece that stands out to you? Our favorite guest room is the two level Silo Suite which has a round living area on the first level and a round bedroom on the second level with a connecting stair. The original thick and textured walls are powerful and soft at the same time. We also love the Presidential bathroom which will be spectacular with luxury tile and wall panel finishes, a big beautiful soaking tub, oversized "tortoise shell finish" porcelain tile floors and, and a large specialty shower! The new lobby, gift shop and concierge lounge area is probably the most exciting new public hospitality space and will be the welcome center of the Mews! Oh, and then there is the new Café and Fitness room! It is all good!!! Download Mobdro Apk On rebelmouse.com/ Chromecast anything on TV from Get Mobdro website the video outcome source which Install Mobdro for Android App and iPhone Free will certainly aid individuals to Mobdro App take pleasure in video clips from Mobdro the whole world, Movies, Shows. Login then click Please Help me with Snapchat Login Unlock your account. That will complete Official the procedure as well as you could utilize the cant login to snapchat application on your smart device once again because Snapchat Login that will make your account a lot more protected.